Are you looking for a soft and flexible breastfeeding bra? 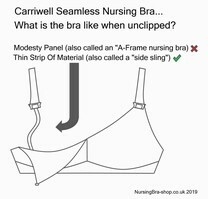 If so, you may like the award-winning Seamless nursing bra from Carriwell. We think this bra has all the best features required in a breastfeeding bra, and it should give you great support as well. So what makes this nursing bra so special? Well, it is made from a silky, soft microfibre fabric which moulds to your body to help you get a lovely, comfortable fit. We also think your baby will like it too thanks to the cup design. This means that your entire breast is bared when the front cup is lowered, meaning more skin-to-skin contact for you and your baby. This should make it an even nicer experience for both of you. How about the construction of this bra? Well, it does not have irritating seams. Nor does it have a stiff underwire. It is a soft cup nursing bra. We think you will like this, as lactation consultants tend to prefer you wear a non-underwired, soft cup bra in your breastfeeding months. How about the sizing? As you may know, your sizing can change quite frequently during your nursing months, and this bra is really good at remaining a good fit. It comes in four sizes. Small, Medium, Large or Extra Large. Please see the size chart below to help you pick the perfect bra. Also, to help you keep the perfect fit, you get a free bra extender. It has 3 hooks and eyes on the back. This bra can expand by up to two back and cup sizes, and re-adjust down too. This is important because it is imperative that during pregancy and nursing that your milk ducts do not become restricted. You will also be pleased to know that the shoulder straps are fully adjustable too. Is it also important to you that you can wear your nursing bra at night too? Well, the Carriwell nursing bra is also perfect as a sleep bra as well as everday wear. When you come to feed your baby, we think you will like how easy it is to open this bra with just one hand. This makes your breastfeeding just a little easier. If you are looking for a nursing bra that looks good under t-shirts or tight-fitting clothing then we think you will like the fact that the seamless bra has a smooth, invisible design. It also has a V-neck design, making it a good choice under low cut tops. This bra ia also available in black and burgundy too – please see below for these options. We recommended that you wash it at up to 40°C with similar colours, and tumble dry or hang it. 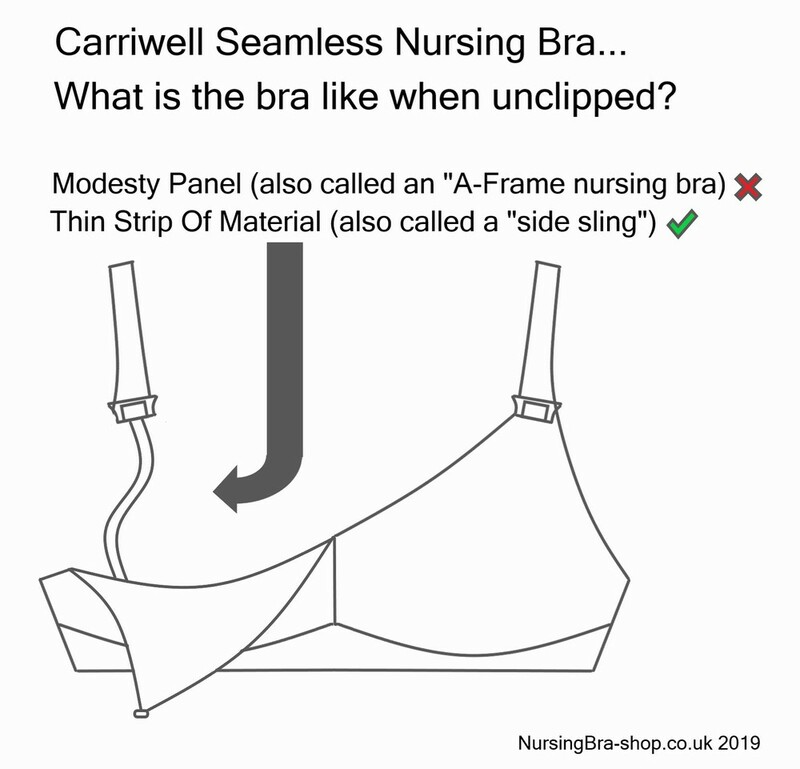 So why should you choose the Carriwell seamless nursing bra? Well, we think you will find it really comfortable and supportive. Getting the right size is easy, and the fact that is it perfect during day and night too means that you will get even more value for money. We think this is a great choice.